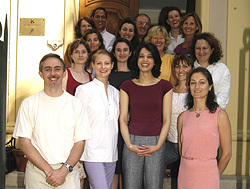 As far as the course is concerned, the lecturers in Aix were very, very good and also very, very helpful. The lessons were of a very high standard and also very enjoyable! 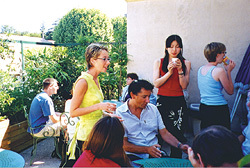 The school itself is very pleasant, not too big, in a good area and it’s easy to get to and from everywhere. My classmates were really great and I already miss them… I want to thank the school for a wonderful week! As regards my host family, all I can say is…what a lovely experience! I couldn’t have hoped for better! The lady took me to the centre of town to help me book tickets for the rest of the trip, showed me everything, shops, places of interest and spent an afternoon with me in town! 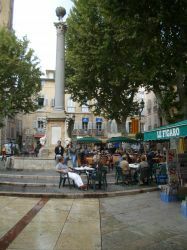 Okay, it is an irresistible play on words, but it is also the truth… I had an Aix-ellent time in Aix-en-Provence! It was SUCH a beautiful place! It was a Roman Spa town once upon a time, so everywhere you go the buildings are of gorgeous golden stonework, the streets are cobbled and every few blocks there is little square to rest in and adorned with the relaxing trickle of one of Aix’s many fountains. It means that it feels like you are in a peaceful haven even in the middle of a bustling university city! My French school was right next to the old town, literally 10 minutes walk from the famous Cours Mirabeau and the Café Deux Garcons where Albert Camus used to hang out. It was awesome! Plus, the weather in Aix is amazing, clear blue skies most of the year round – they actually get 300 days of sunshine annually! Even in early spring (which is when I went) I could comfortably sit outside on a café terrace, lap up the sunshine and relax, watching the French world go by. That the famous painter Paul Cezanne was born in Aix-en-Provence can’t be a coincidence. If I could paint I’d probably also feel the urge to immortalise all the beautiful things in Aix on a painting. But instead of paintings I’ve got like a million pictures from my stay in Aix. I’ve got pictures from the colorful market place, the fountains, the night clubs and the small cafe where I used to sit for hours. 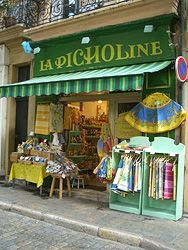 Aix-en-Provence is, without a doubt, my favourite place in the whole of France! It’s not often that somewhere exceeds all of the swishy romantic ideals you have about it… Aix-en-Provence did! It took me less than 12 hours to fall utterly in love with the place. It is so beautiful, and scenic, and rustic, and quaint, but also so full of life and culture – it is just so FRENCH! In truth, before I arrived, my education on Provence came mainly from reading A Year In Provence and watching Jean de Florette, so as you can imagine, I was expecting nothing less than cobbled streets bathed in golden sunshine, splashing sounds of water fountains at every turn and the smell of freshly baked baguettes to follow me everywhere. But shockingly that is EXACTLY what I found in Aix! It is a bustling university city and does have everything your typical 21st century westerner ‘needs’, (ie. Internet café, public transport… The Gap), but quite honestly, wandering through the old town you couldn’t be blamed for thinking you had been transported 100 years back in time.